When spring slowly starts to come around, you need the help of Morris County blacktop pavers to fix up your driveway. Spring is the best time to check up on your pavement and see what needs fixing while preventing future problems. There are many ways you can take care of your driveway to keep it going throughout the whole year. To keep your blacktop in premium condition, read on for a few things you can do to help. If the snow is having trouble melting, make sure you help it along by clearing out the last amount of snow. When you shovel, make sure you don’t take the driveway with it. Shovel lightly on top of the pavement and don’t shovel too deep. If you have a snow plow, keep the plow on top of the driveway. Try not to add extra stress or scratches to your pavement. While you’re tackling the garage during spring cleaning, you might as well scrub the driveway. Clear away any branches or debris that has built up over the winter, and check for any unattended stains. Sometimes an oil stain is obvious, or it surprises us. There are many ways to get rid of oil stains such as using coke, kitty litter, or baking soda. Asphalt has a way of deteriorating much faster when it goes uncleaned. For older stains, they may never come out completely, so adding a sealcoat on top after you clean could be the way to get rid of old stains as well as repair any minor scrapes and holes. Sealcoating can also add an extra 10 years to the life of your asphalt as it prevents cracks from forming, so we’d recommend doing this when you clean it up. Sometimes the harsh snow and rain breaks down your driveway before you get a chance to prevent it. If you see cracks or potholes forming, it’s best to fill them in sooner rather than later. Not only does it become harder for you to drive on your driveway, but those holes only get bigger the longer you wait. Especially in the spring time, the water will pool on the pavement and inside the holes, worsening the damage. Hire a paving contractor to fill in those potholes as soon as you can. The edges of your driveway are the most vulnerable part of you asphalt path. To prevent chipping and cracking, keep plants back and away from the edges so they don’t try sprouting anywhere near your driveway. You also want to keep heavy vehicles further away from the edges. If you park large trucks or allow construction crews to park their vehicles near the edges, you driveway won’t last. It will crack under the weight if you put all the pressure on the edges. Just be cautious around the edges of your driveway to keep the entire surface in good shape. Standing water is one of the greatest enemies of driveways. Standing water creates uneven surfaces and eventually makes cracks and potholes. In preparation for the heavy rains, make sure there are two to three inch trenches on either side of your driveway. Make sure none of your gutters or drains lead onto your driveway to minimize any chances of puddles. If you still see puddles form, consider evening out your driveway to help the rain runoff into the drains. Proper drainage ensures a smooth surface, and a smooth surface helps proper drainage. Do you need some quality Morris County blacktop pavers to repair your driveway this spring? 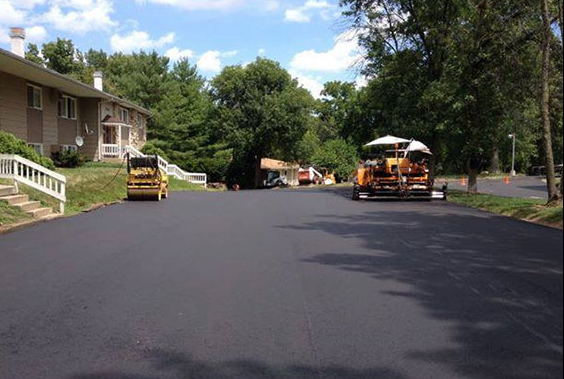 Asphalt Direct Paving has over 35 years of experience for all your paving needs. Visit our website or call 973-267-3040 to get an estimate today.